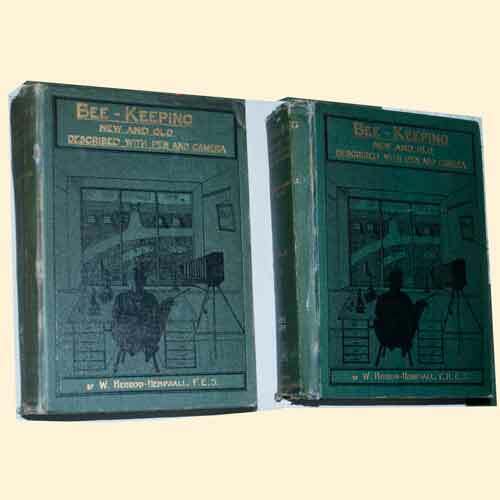 Beekeeping New and Old described with Pen and Camera, Volumes I and II by W Herrod-Hempsall, 1st Edition 1930 and 1937. Hardback, Volume I 772 pages, Volume II 774 pages. Condition: Well used but good and clean throughout, covers rubbed with spine fading and wear as expected, hinges worn, library marks and front end bookplates. One of the most comprehensive works on British beekeeping ever written - invaluable reference and research resource. These are really thick books and profusely illustrated - filled with beekeeping information that many have forgot - a must have for the beekeepers library.